Although the last holdouts in Corrigidor didn’t surrender until May 1942, it is April 9th that is the anniversary of the surrender of Bataan. On the Bataan Death March, approximately 54,000 of the 72,000 prisoners reached their destination…All told, approximately 5,000-10,000 Filipino and 600-650 American prisoners of war died before they could reach Camp O’Donnell. In the Philippines, the day is named Araw Ng Kagitingnan, the day of valour. 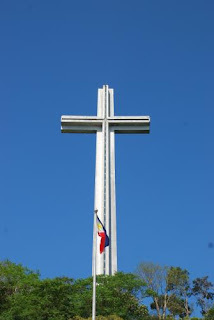 There is a cross on Mount Samat to commemorate the valor of those soldiers, although Americans might be startled to see that the base of the cross includes the images of several other Filipino heroes, including a picture of an angry LapuLapu, the tribal leader who did in the arrogant Magellan. An account of the March through Filipino eyes can be found HERE. No, none of our relatives were there, although my husband’s brother and cousin were guerilla fighters and my then teenaged husband joined them at the end of the war. Despite this, there is a dearth of literature about those days, especially stories of ordinary folks.Â Perhaps the problem is that such memories are too bitter to repeat. My husband’s generation don’t want to talk about such things. For example, one day when we passed a stately but deserted house near our town, I asked why it was empty, the answer was that it was haunted…and only later did I find out it had been used as a Japanese military headquarters, and that his cousin and many others had been taken there, tortured, and killed. 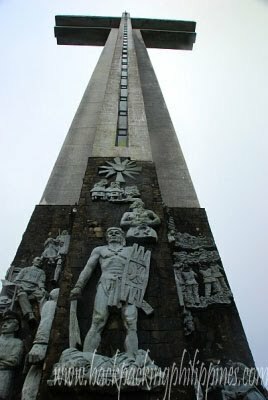 There are TV shows about the fight, to remind the young about the heroism of their grandfathers, and some schools do attend day trips to the Bataan memorial, but too often there is an underlying resentment in articles about the war written by the elites of the Philippines; often they hint that the Philippines was caught like a mouse between two fightingÂ elephants, even though most historians figure that even an “independent” Philippines would have suffered a Japanese invasion on the way to get the oil and rubber of South East Asia. To make things worse, the dirty little secret is that many of the “best” families helped the Japanese occupation. Today, little white crosses dot those spots where our soldiers fell and diedâ€¦all along the death march route. But there are still places unmarked by white crossesâ€”where some soldiers are buried unknown. They may be lonely, lying there all alone, forgotten and unknown. Every year in New Mexico, they hold a memorial celebration to remember, because one of the US Army units called up to defend Manila was the multi ethnic NMNational Guard. So our church in Mescalero had a memorial in the back to remember the local Apaches, as well as the local priest, Father Albert Braun, who were in the Death march. But it is a sign of the times that part of the memorial celebration in New Mexico is…a marathon run. But whereas the “run” in New Mexico is mainly by those who have military ties, the one here is merely another “marathon” by local runners. sigh…I don’t know whether this type of news story should make one laugh or cry. No user commented in " Araw Ng Kagitingnan: Remembering the Bataan Death March "